Where do I use my Tessuti voucher code? Browse the site and add the products you wish to buy to your basket. Once you have the items in your basket click ‘Checkout’ in the top right corner of the page. At the basket page below your items, you will find the discount code box. Enter your code and click 'Redeem'. Any discounts or offers will be automatically added and displayed in your order total. Tessuti brings online shoppers premium brands in designer men's clothes, from casual wear and everyday clothing to sharp work clothes and formal shirts. Established in 1985, Tessuti’s sizeable online offerings let you pick from the very finest names in men’s clothing, accessories and footwear, with Armani Jeans, Stone Island, Ralph Lauren, Hugo Boss, Lyle & Scott and much, much more on their shelves for your perusal. 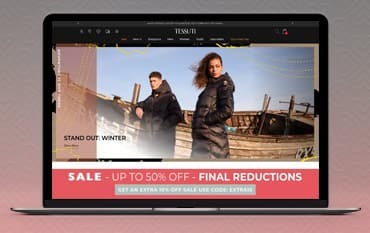 Our Tessuti discount codes are on hand to save you money on everything from t-shirts, smart jackets and chinos to swimwear, sweaters and shoes, as well as all the accessories like wallets, watches, bags, ties and underwear you need to feel impeccably dressed from head to toe at great low prices. Tessuti have stores across the country, and delivery of your order to any of those is free - but if you’d rather they come to you, then your order can be sent with free standard delivery instead. If you want to be dressed in the very latest styles by the very best designers like Armani, Hugo Boss, Calvin Klein, Vivienne Westwood and Michael Kors, then you need to buy your clothing from Tessuti. Shop here and you are guaranteed to look exquisitely clothed in up to the minute quality clothing, perfect for every occasion. You'll find Tessuti have stores all around the UK, so you won't need to travel too far to browse through the myriad of styles on offer. Shop in Tessuti Liverpool, Tessuti Chester, Tessuti Trafford Centre, Tessuti Cheshire Oaks and Tessuti Edinburgh to name just a few, to find your nearest store check out the store locator. Tessuti's Menswear and Womenswear departments offer up to the minute styles from all your favourite brands. For men, there is a great selection of casual wear like T-shirts, chinos, hoodies and sweatshirts as well as impeccable formal wear like suits, trousers, jackets and shirts. For women, there are dresses to suit every occasion in addition to more casual wear such as jeans, tops, shorts and T-shirts and for both, there is a huge choice of luxury accessories to complete the outfit. For more delivery details & times, see here. If you wish to return an item, there are various ways you can do so with Tessuti. Collect+ is Free of charge and you can drop your parcel off at over 4,500 locations. You can also return using Doddle - choose which method you would prefer. The quickest and easiest way to return your item to your local Tessuti store! All items must be unused and in their original packaging. Get more Returns info here. Find the opening & closing times of a store near you using the Store Finder tool. Tessuti provides the latest designer clothing and accessories for men, women and children. Save money on a new wardrobe with a Tessuti discount code and get the look for less. They offer luxury styles from contemporary brands like Calvin Klein, Emporio Armani, Boss, Paul Smith, Vivienne Westwood, Polo Ralph Lauren, Armani Jeans, Lacoste and much more. So whether you are searching for a chic designer handbag or the very latest trend in clothing, you are sure to find what you are looking for here.